Catherine is a dynamic, compassionate School Principal who inspires all staff to excel. 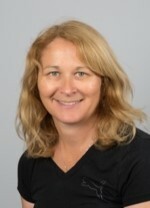 An outstanding educator of students with disabilities who has utilised her exceptional leadership skills to develop Burbridge School as a leader in educating students with complex disabilities. Jennifer is a professional and passionate Education Assistant (EA). She began working at Kenwick School in 2014. She is an enthusiastic and friendly Education Assistant who is supportive to all students and staff at Kenwick School. Colleen is a highly reflective education assistant whose dedication to the students and loyalty to the school that sees her constantly go above and beyond so that each and every student gets the very best opportunities every day. A real power house of energy who gives her all and never any less. Tracy is an experienced Education Assistant who has specialised in her work in a school garden program. She has worked with students with disabilities by creating sensory experiences throughout the garden. She has introduced students to the importance of caring for animals and the environment. Janine is a passionate educator with a drive to create authentic and engaging experiences which support student development and health and wellbeing. Her passion and drive aligns to creating a ‘Future Without Limits’ across both the classroom and community environment, inclusive of Workplace Learning. Josie completed B. Ed (Early Childhood/Special Needs) in 2014. She gained experience through Leeming Childcare Centre, relief work and as Pre-Primary Teacher at Banksia Park Primary School. In 2016 she joined Carson Street School to follow her ultimate passion of working with children with special needs. Sandra is a determined and passionate Teacher who strives to consistently perfect her practice. She's committed to inspiring change and assumes that every child has the potential to become an effective communicator and to participate meaningfully and successfully with their family, school and community. Throughout her career Viki has been passionate about student’s needs, and she seeks to support students beyond the classroom. This passion for education especially for those with special needs, motivates her desire to see students succeed and have the opportunity to reach their full potential. Judi is a passionate exceptional teacher who works tirelessly. Her background in teaching, law and politics brings a wide knowledge base and experience to CCESC. Her positivity, professionalism and strong work ethic has made her a valuable role model for her students to reach their full potential. Aaron’s career began with a Graduate Diploma in Secondary Education in Visual Art and Special Needs Education. 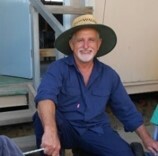 Three years on he has completed a Graduate Certificate in Special Needs Education with a passion for educating students with disabilities and complex communication needs in the primary years. 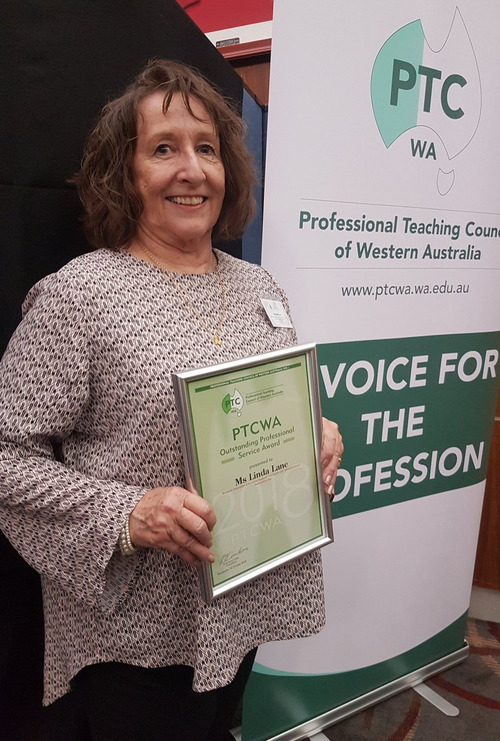 Congratulations to Linda Lane who was nominated by WAESPAA for the PTCWA Outstanding Professional Service Award. Linda was presented with this prestigious award on Wednesday 25th October alongside peers who were also recognised from other Education Associations. Linda has made a positive contribution towards enhancing educational outcomes for students with special needs and in supporting the members of WAESPAA in the roles of committee member, treasurer and president. With great respect and pride we congratulate Linda as a valued colleague and a vital contributor to our Association members, our students and to our sector. 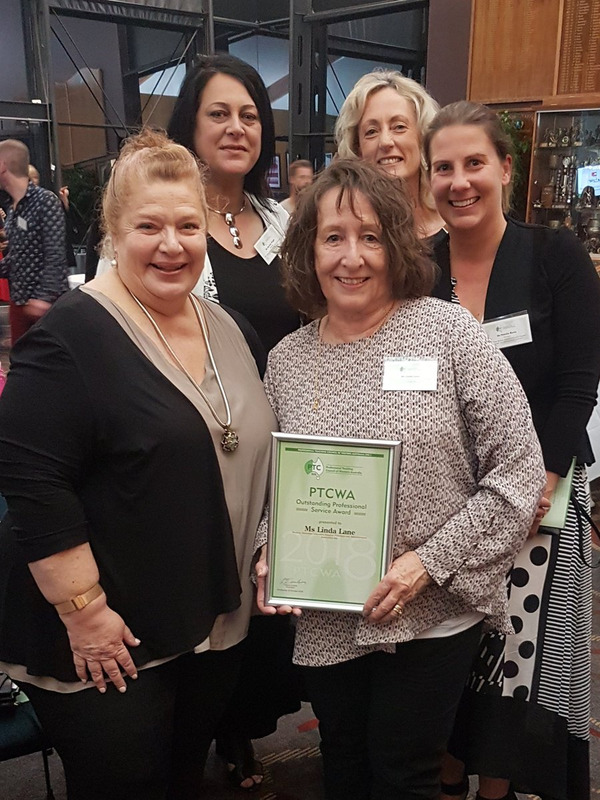 It is this service we choose to celebrate and in this context that the PTCWA Outstanding Professional Service Awards has been awarded.